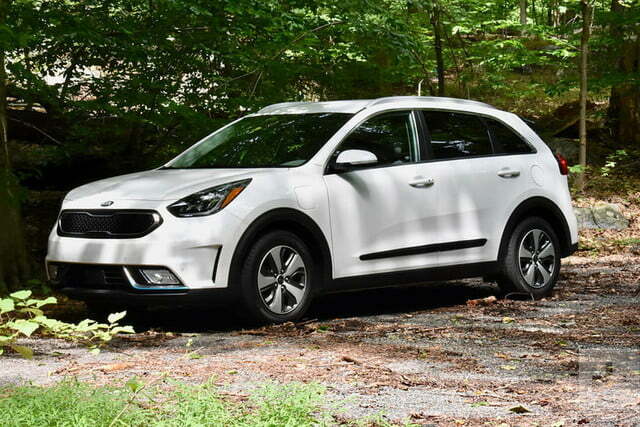 The 2018 Kia Niro PHEV is for people who want a normal car that just happens to be a plug-in hybrid. 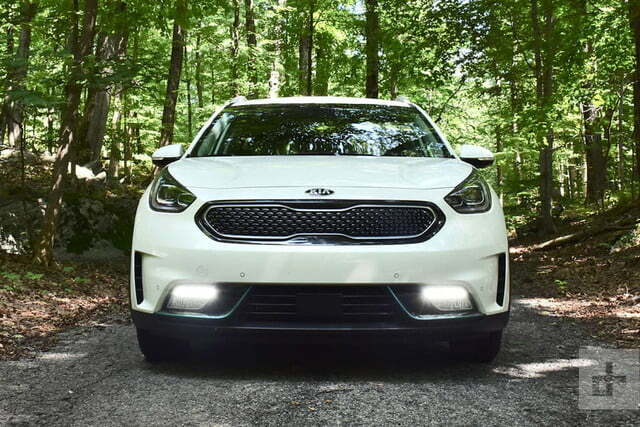 The 2018 Kia Niro is a car for people who don’t really know what they want. 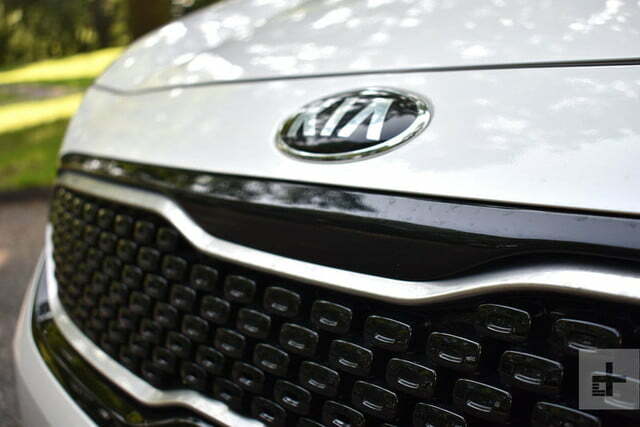 We tested it with a plug-in hybrid powertrain, but Kia also offers a conventional hybrid, and will soon add an all-electric model to the lineup. The Niro’s tall body and low ride height blur the line between crossovers and hatchbacks. But in trying to fill every niche, has Kia created a car that doesn’t quite fit anywhere? 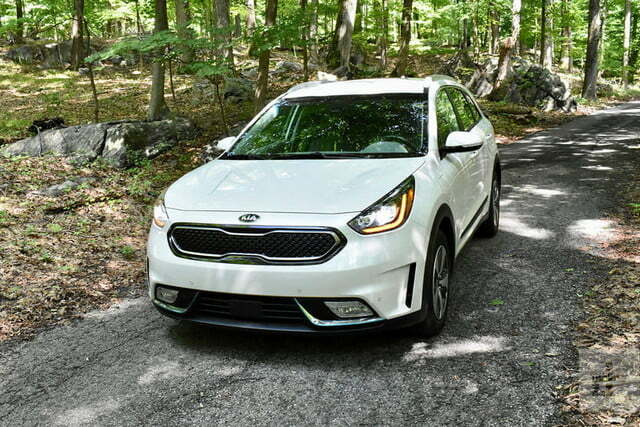 To find out, we borrowed a 2018 Kia Niro PHEV EX Premium for a few days. 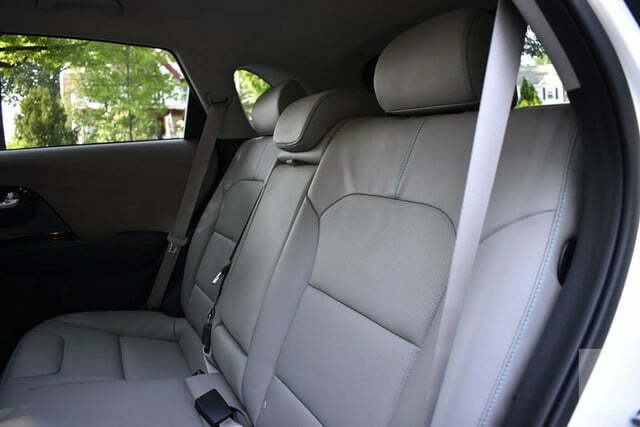 This is the highest of three trim levels so in addition to standard features from the more basic LX and EX models, such as 16-inch alloy wheels, adaptive cruise control, and Apple CarPlay/Android Auto compatibility, our test car benefitted from leather upholstery, heated and ventilated front seats, a heated steering wheel, navigation, and an upgraded eight-speaker Harman Kardon audio system. Our tester also wore the optional snow white pearl paint ($395) and came with carpeted floor mats ($135). The base Niro PHEV (plug-in hybrid electric vehicle) LX starts at $27,900, but our EX Premium tester rang in at $35,970 with destination. The Niro’s competitors include the Toyota Prius Prime, Chevrolet Volt and Kia sibling Hyundai’s Ioniq Plug-In Hybrid. Like the Niro, they’re dedicated green models that don’t have non-electrified counterparts. 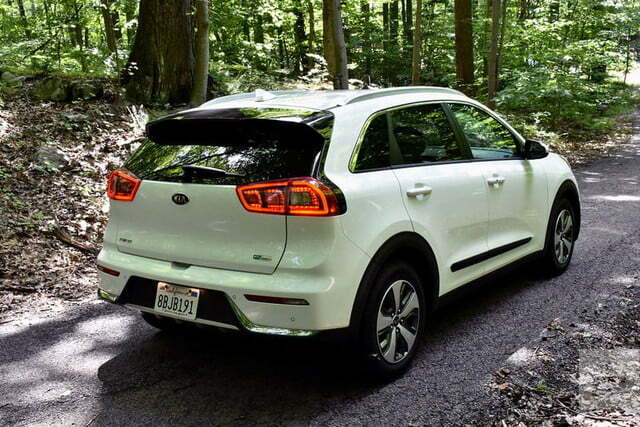 Since Kia considers the Niro to be a crossover, it’s conceivable that people might cross-shop it against the larger Mitsubishi Outlander PHEV as well. 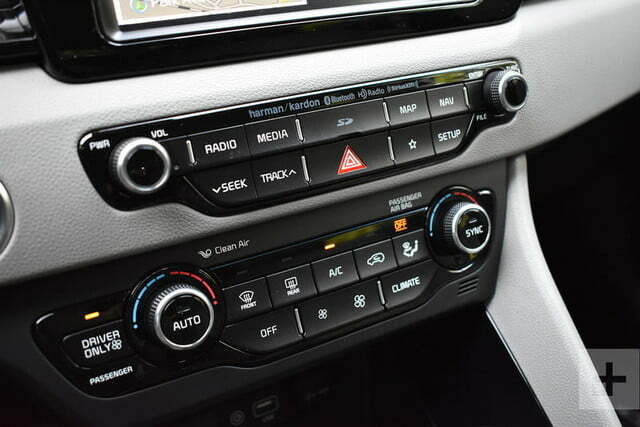 Kia interiors have come a long way over the past few years, but the Niro feels retrograde. Despite the fact that we were driving an EX Premium with all of the bells and whistles, the interior felt cheap compared to even the lowest trim level of a Kia Sportage. The acres of grainy plastic and low-quality seat materials reminded us of a taxi. Kia tried to dress the cabin up with swatches of piano-black material, but this will likely get smudged and scratched in regular use. While it doesn’t look nice, the interior is very functional. The Niro lacks the high-and-mighty driving position of a true crossover, but it also does without the high step-in height of many of those vehicles. The tall roof creates a wide expanse of glass that provides excellent outward visibility. It also pays dividends in interior space. The Chevy Volt, Hyundai Ioniq, and Toyota Prius Prime may all look sleeker than the Niro, but the Kia’s taller roof yields greater headroom. 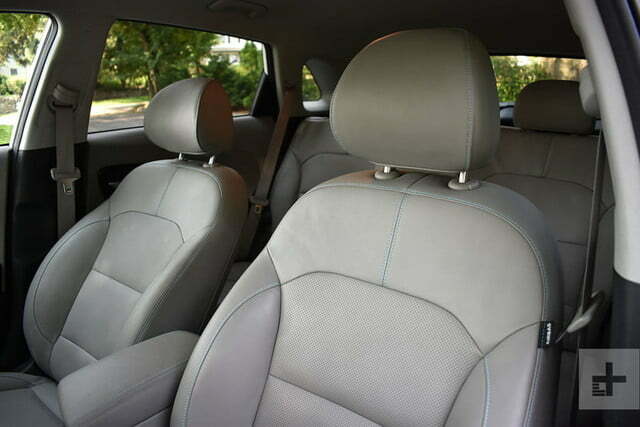 The Niro also offers more rear legroom than any of these plug-in hybrids, although some give front-row occupants more room to stretch their legs. The Hyundai and Toyota also offer more cargo space. The Niro offers better gas mileage without any weirdness. The closeness of the competition shows the Niro is really a hatchback rather than a true crossover like the Mitsubishi Outlander PHEV. The Mitsubishi offers 30.4 cubic feet of cargo space with the rear seats up (62.8 with the seats down), compared to the Kia’s 19.4 and 54.5 cubes with the rear seats up and down, respectively. 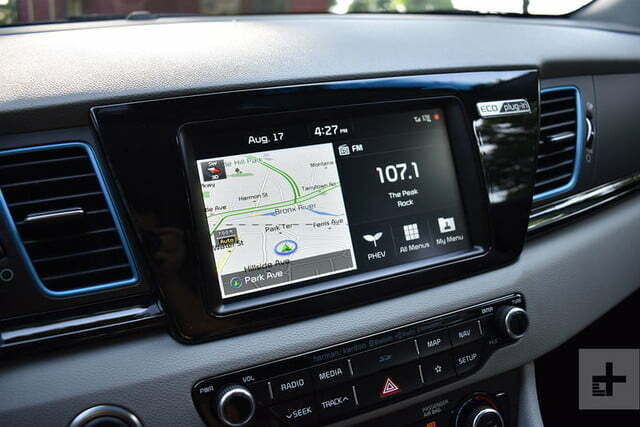 Kia offers a 7.0-inch touchscreen infotainment system with Apple CarPlay and Android Auto as standard equipment, but EX Premium models like our test car had an 8.0-inch screen with navigation, as well as a 7.0-inch TFT instrument-cluster display. USB, auxiliary, and 12-volt ports sit at the base of the center stack, along with the wireless charging pad offered in EX Premium models. 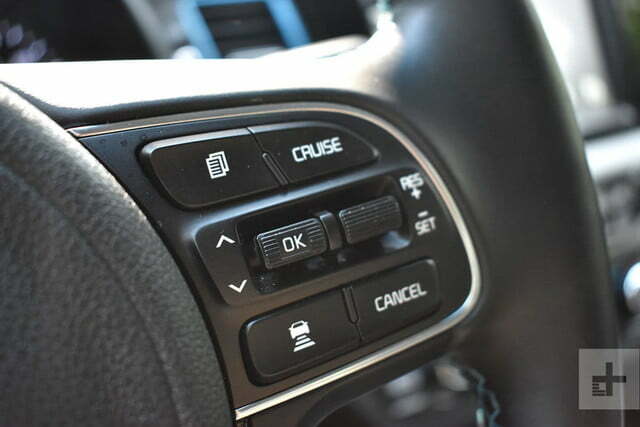 A second USB port, for charging only, is hidden in the center console. The touchscreen is backed up by a much-appreciated array of analog buttons. 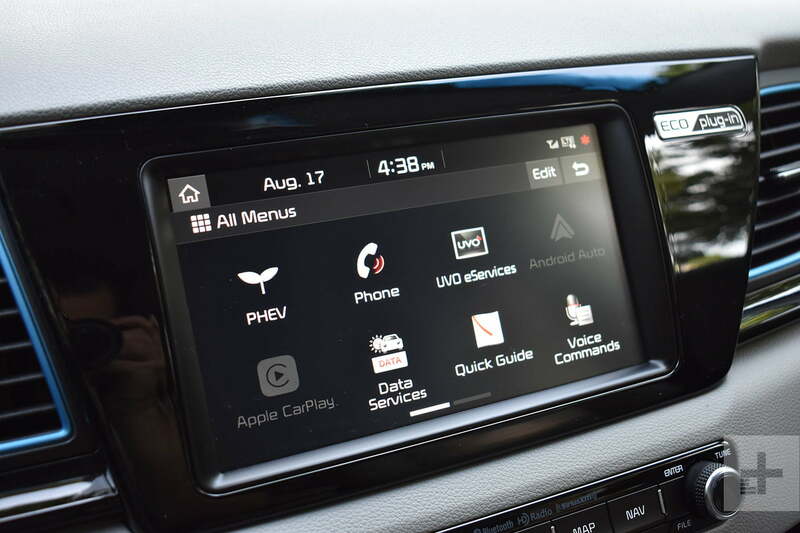 The graphics are clean if unremarkable, and the screen was responsive, albeit a bit sluggish while running Android Auto. To the left of the speedometer, the Niro PHEV has a dial with “charge,” “eco,” and “power” sections that’s supposed to indicate what the powertrain is doing. We got a better idea of that from the energy-flow graphic that can be called up on the TFT screen. This screen also displays a tachometer when the car is switched from its default eco mode to sport. Efficiency-focused rubber is the Niro PHEV’s weak point, holding back what is actually a fairly well tuned chassis. The Niro PHEV comes standard with autonomous emergency braking, adaptive cruise control, lane keeping assist, and driver attention alert. The EX Premium model also gets blind spot monitoring, rear cross traffic alert, and parking sensors. The adaptive cruise control worked fairly well, but it was a bit slow to respond when the vehicle being followed picked up speed. With lane keeping assist active, the steering wheel constantly squirmed in our hands as the car hunted for the proper position. More so than a lot of other plug-in hybrids, the Niro PHEV drives a lot like a regular car. That’s largely down to the powertrain. The Niro uses a 1.6-liter four-cylinder engine which, unlike in many other hybrids and plug-in hybrids, is mated to a conventional transmission, in this case a six-speed dual-clutch automatic. The gasoline side of the powertrain works with an electric motor and 8.9-kilowatt-hour battery pack, which sits under the cargo floor and rear seat. Total system output is 139 horsepower and 195 pound-feet of torque. Power is sent to the front wheels only; despite pitching the Niro as a crossover, Kia does not offer an all-wheel drive option. The EPA rates the Niro PHEV at 105 MPGe combined on electricity and 46 mpg on gasoline, with up to 26 miles of all-electric range. That’s one mile more than the Toyota Prius Prime, but four less than the Hyundai Ioniq (which uses the same powertrain as the Niro but is lighter and likely a bit more aerodynamic), and much less than the Chevy Volt’s 53 miles. The Prius Prime is the efficiency leader at 133 MPGe and 54 mpg. If you thought it was worth getting the Mitsubishi Outlander PHEV for its all-wheel drive, consider its lower ratings of 74 MPGe, 25 mpg, and 22 miles of electric range. 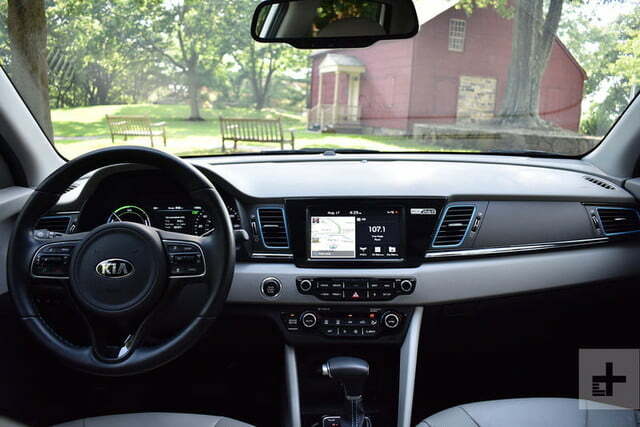 Kia interiors have come a long way over the past few years, but the Niro feels retrograde. 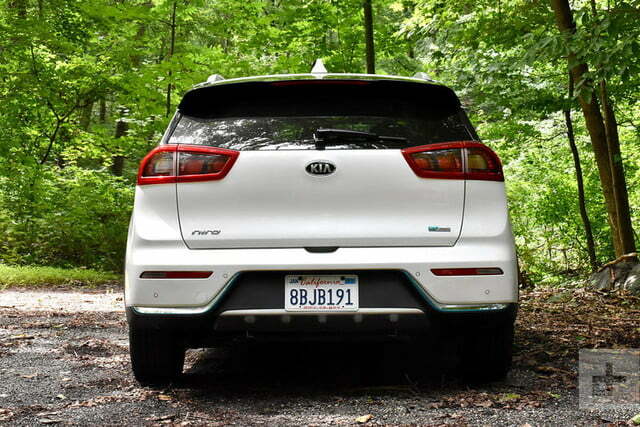 Kia claims a full recharge from a 240-volt level two charging station takes 2.5 hours, which we were able to verify, while charging from a standard household outlet takes nine hours. 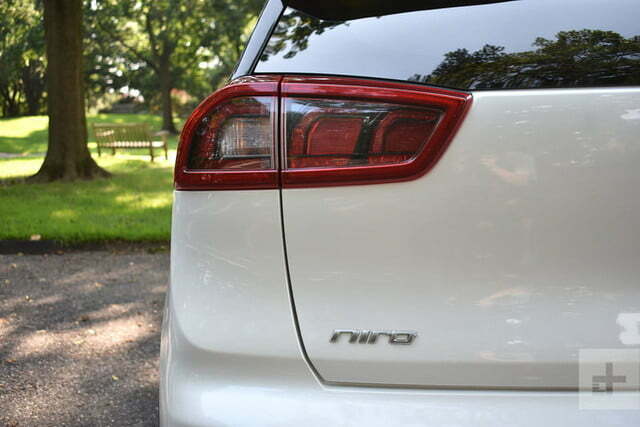 The Niro’s charging port has a lock, which prevents random people from unplugging the car. That’s great, unless you are unaware that this feature engages automatically, as we were the first time we plugged in. The EPA-rated 26 miles of electric range is achievable in the real world, but only with a very gentle right foot. 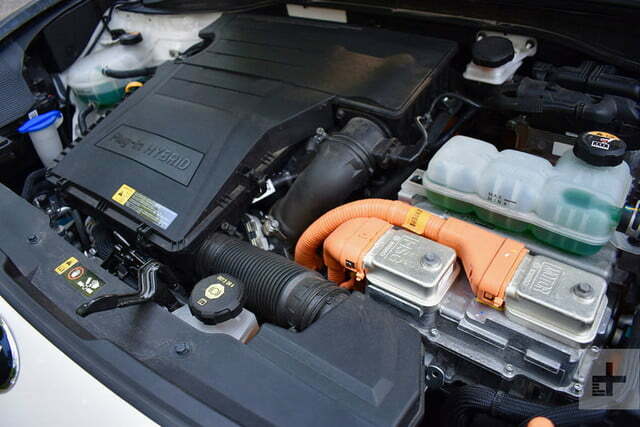 The gasoline engine kicks in under heavy throttle no matter how much charge is left in the battery. We achieved an average of 49.5 mpg over about 195 miles of driving in mixed conditions that included some all-electric running, according to the car’s trip computer. The only parts of the driving experience that scream plug-in hybrid were the long moments of silence during electric driving, and the electric motor’s instant kick of torque, which could spin the tires on command off the line. That efficiency-focused Michelin Energy Saver A/S rubber was the Niro PHEV’s weak point, holding back what is actually a fairly well tuned chassis. 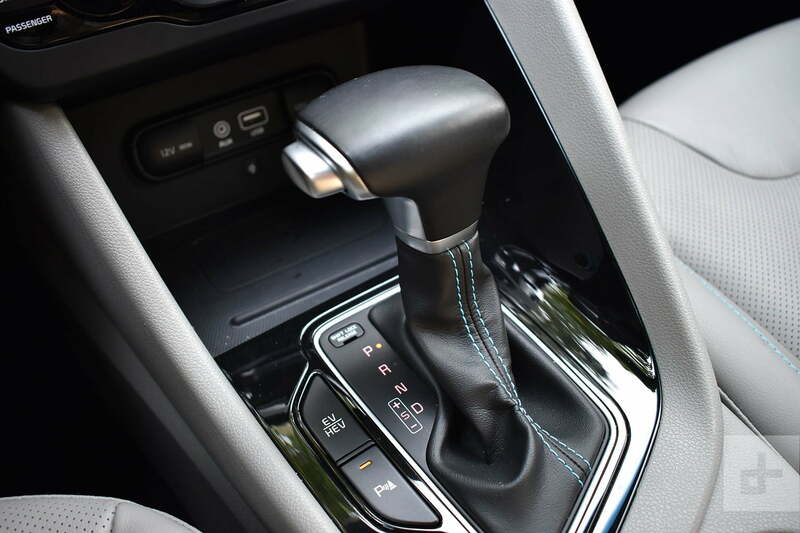 The suspension did a great job controlling body motions, and the dual-clutch transmission made the powertrain’s actions more predictable than in some other hybrids and plug-in hybrids (and even holds manually-selected gears up to the redline in sport mode). But the tires don’t offer enough grip for spirited driving. 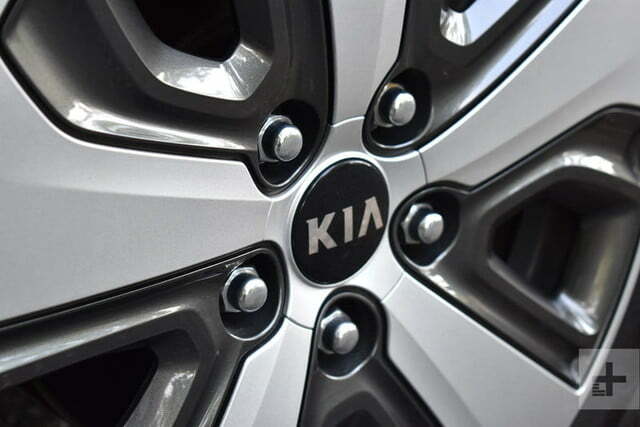 Kia offers a five-year, 60,000-mile basic warranty that includes roadside assistance, and 10-year, 100,000-mile warranties for the powertrain and battery pack. 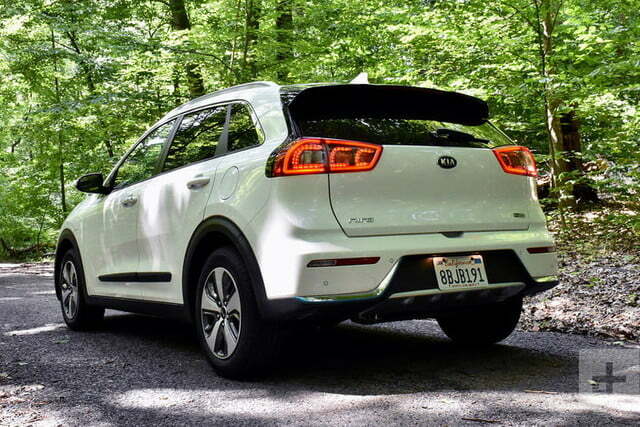 Kia has a fairly good reputation for reliability, and the non-plug-in version of the Niro received a “much better than average” reliability rating from Consumer Reports. We weren’t impressed with the EX Premium trim level’s interior, so we’d save some money and go with a basic LX model. That means sacrificing the 8.0-inch touchscreen and TFT display, as well as niceties like power front seats, but we think the Niro makes more sense as a basic plug-in hybrid runabout than a faux luxury car with every option box checked. The LX also includes a decent array of tech features, including an Apple CarPlay- and Android Auto-compatible infotainment system, adaptive cruise control, autonomous emergency braking, forward collision warning, and lane keeping assist. 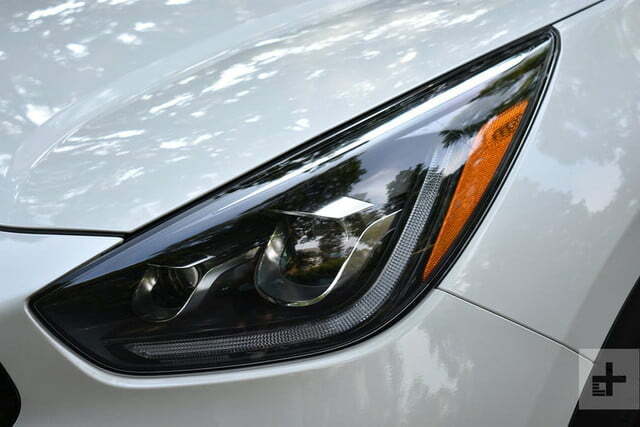 The Niro is hard to classify. Kia says it’s a crossover, and its tall roof sets it apart from regular hatchbacks. But the Niro sits low to the ground and lacks all-wheel drive. Once you get behind the wheel, the picture becomes much clearer. The Niro feels like a normal car that just happens to be a plug-in hybrid, and that might be its greatest asset. The Chevy Volt, Hyundai Ioniq, and Toyota Prius Prime do more to advertise their eco credentials (which may be what some buyers want), and have an edge in one if not all efficiency metrics. But the Niro lets its driver fly under the radar. It offers better gas mileage without any weirdness. If fuel efficiency is your main concern, the Chevy and Toyota are better choices. The Prius Prime offers about the same electric range as the Kia, but uses less gasoline and electricity. The Volt’s 53-mile electric range means it can be driven with the engine off more often. However, both cars take a bit longer to acclimate to. Kia calls the Niro PHEV a crossover, but if a crossover is really what you want, the Mitsubishi Outlander PHEV is a better option. 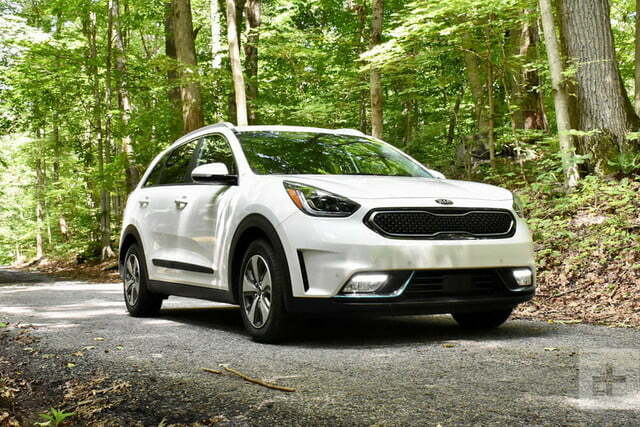 It offers the jacked-up driving position and all-wheel drive of a real crossover, though its bulkier body makes it substantially less efficient than the Kia. Finally, we have the Hyundai Ioniq Plug-In Hybrid. It uses the same powertrain as the Niro, and is pretty close to the Kia in terms of interior space. Other than the jellybean-like exterior styling, Hyundai also kept the Ioniq fairly conventional. But the Ioniq Plug-In Hybrid is only available in California, Connecticut, Maine, Maryland, Massachusetts, New Jersey, New York, Oregon, Rhode Island, and Vermont, while the Niro PHEV is available nationwide. Yes. With more interior space and a more conventional user experience, the Niro PHEV is a great alternative to the Prius Prime and Volt. Unlike its Hyundai Ioniq cousin, the Niro is also available in all 50 states. Just don’t call it a crossover.